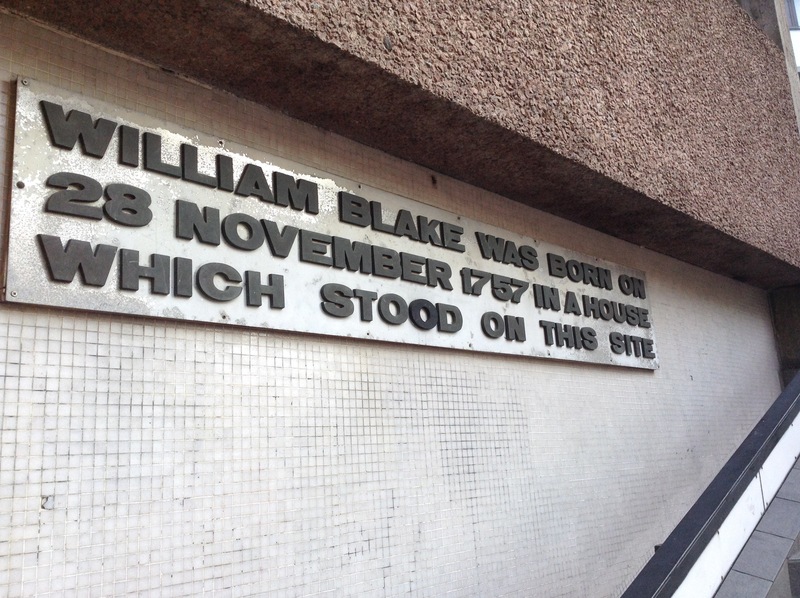 William Blake was born in London on 28th November, 1757 (d.12th August, 1827) and lived all his life in the city, apart from an absence of 3 years, when he lived in Felpham (Sussex). He is difficult man to fathom, despite detailed and comprehensive study of his work, particularly in the late 20th century; he seems to stand entirely alone in his collection of crafts. He was pre-Romantic, yet a Romantic poet; a printmaker and painter (engraver, printer and illustrator of his own illuminated poems and manuscripts). Artist or genius, or mystic or madman? Perhaps an element of each; unafraid to show, explore and reveal his true self. His home in Soho, London was demolished in 1965, and is recognised by this plaque below; his grave is unmarked, he lies somewhere in Bunhill fields, (Islington, London), where there is a memorial stone. He must have been that rare man who is both innocent and experienced.